Adopted at birth, Phil grew up in Auckland, New Zealand and was brought up in a Christian home. Although he made a commitment to Christ at the early age of eight, he still struggled with his identity. Like teens the world over, Phil struggled with image in his teenage years, but he found strength in God's promises, in the companionship of Christian friends and in music. When given the ultimatum, "Do your homework or get a job", He chose the latter and left school to become a hairdresser. At the same time, He spent every spare moment in his "off-time" as lead singer and guitarist in his band Drinkwater. Five years later, after being offered a position with Newsboys, Phil Joel found himself in Nashville - his long lost home away from home. Knee deep in the music business, Phil met Heather, the girl of his dreams, in Kansas and married her a year later. His debut solo album, "Watching Over You" has been 27 years in the making. The ideas and emotions contained in it are retrospective of Phil's life up to the present. The result is a solo album in the truest sense of the word because it's a story only Phil could tell. 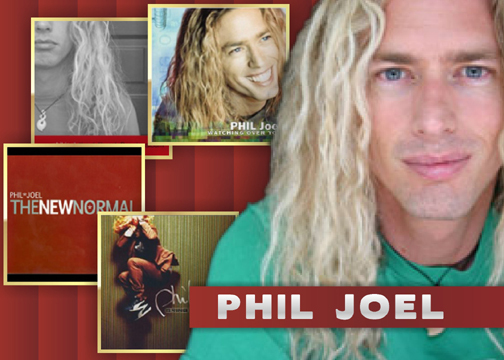 Musically, you can expect the same innovative, modern pop Phil has contributed to in his work with the Newsboys-with whom he'll continue to work - but with a different edge to it. And although it's somewhat subjective, there is a certain vulnerability that courses underneath the lyrics here. It's not as polished as one might think, not as predictable as one might imagine. It's real, but it's good. It's what it's supposed to be. My name is Lani and I live in Wisconsin. I have been a great fan of the Newsboys for quite some time. Recently I got a hold of Phil Joel's CD "Watching Over You" and am enjoying it a lot. The song "Watching Over You" I found to be a really neat, and meaningful song yet fun to sing. I was typing out the words to it so that I can teach our young kids in Bible Class the song (I'm in charge of song time) because I think they will really like it. Anyway, I started reading through all the pages and words of all the songs and all the comments you wrote, I just want to thank you so much for living your life for our Lord. I'm not sure if you really know just how much you and all the other Christian artists actually touch peoples lives. Your words and music are like medicine to me. It's like my soul is fed every time I listen to you. There really isn't any other way to describe how your music works. God is using you in a very powerful way. I can't imagine how hard it is to be away from your family so much, but I just wanted to encourage you and anyone you want to share this with that God is working through you and you are affecting lives with your music. Thank you from the bottom of my heart for all you do. I am looking forward to seeing you and the rest of the Newsboys on Nov. 16th. You will be in GreenBay, WI at the Power Of One concert along with a few other bands. It is such a great feeling to see God move in a place full of people. God bless you, Phil, and all your family and friends. I pray for you and yours all the time. I just wanted to say that his music has been an inspiration for and has made me want to keep living for the Lord. The song "Strangely Normal" has helped me realize that everybody is normal in their own way and that we shouldn't judge others because we are just like them in some way or another. The Phil Joel CD also helped me want to get to know the Lord now. I used to have a one day a week relationship with the Lord, now I read the Bible every night and I pray over what may seem like the tiniest things. I have now come out of being an under-cover Christian. It made me realize that I wasn't living my life the way I should have been. It cut me to the heart and has helped me care about others and pray for people that I may or may not know. My walk with the Lord has strengthened enough that I can now help others with their walks to an extent. I have come out of being an under-cover Christian. When I return to school I hope to be able to reach out to those in need and not let other kids words hurt me. I hope to be able to forgive others of what they have done to me and not hold it against them. I hope to be able to ask others for forgivness for what I have done to them.